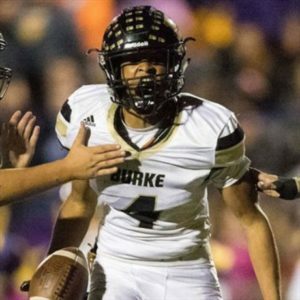 The 2018 recruiting class has wrapped up, and it ended with a resounding thud. While I have yet to assign final TTB Ratings for the class, I will dare to give a grade for the position groups. Scoop: Michigan targeted several high-profile quarterbacks in the 2018 class, but many of them were looking elsewhere. Southern kids and California kids were the hot items, and those people are difficult to recruit. 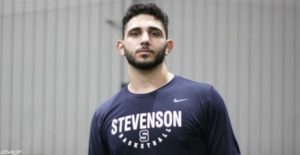 Michigan got a physical specimen with perhaps the strongest arm in the whole class, but people are concerned about his mechanics and accuracy. He could be Ryan Mallett – but seemingly without the discipline issues – and have a fine college career, but usually inaccurate quarterbacks don’t become extremely accurate quarterbacks. Milton will never be Baker Mayfield and complete 70% of his throws, but he could be a guy who’s able to push the ball down the field and create big plays. Meanwhile, I’m counting Shea Patterson as a recruiting victory, even though he’s a transfer. Patterson has been much discussed, and he’s probably the favorite to start if he wins his appeal to the NCAA for immediate eligibility. Dorian Thompson-Robinson is a very solid prospect, but he fits better at UCLA with Chip Kelly. In fact, he committed to Jim Mora – which was an okay decision – but things got even better when the Bruins traded Mora for Kelly. Scoop: Michigan missed out on their higher level targets, but it wasn’t a great class for running backs, in my opinion. I really liked Keaontay Ingram (Texas), but he never gave Michigan much of a shot. Instead, the staff went for a potential Wildcat QB (Barrett), a physical runner (Haskins), and an all-purpose guy (Turner) to cover all their bases. All three have potential, but they’re not surefire contributors. 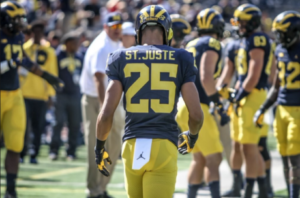 I like Salahuddin as an all-purpose guy who could return kicks and split out in the slot, but Michigan got in on him late. 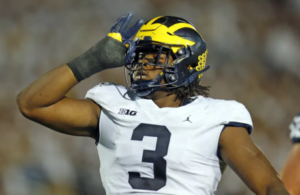 I could see each of the three tailback signees playing a role and rotating just like Michigan has done in the past few years. VanSumeren is a very good all-around player who could split time with Ben Mason as a freshman. 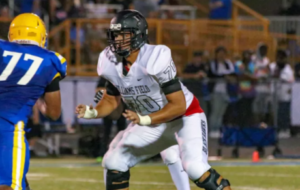 It’s not a high-impact signing, but Michigan got a good one who fits what Michigan wants to do in VanSumeren. 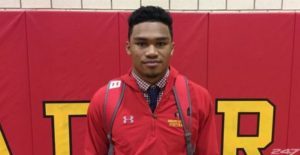 Scoop: I see some reasons that Bell could be successful in college. He’s got some nice agility and good playmaking instincts. He’s not the biggest or fastest guy, but he might be a guy who just gets the job done. 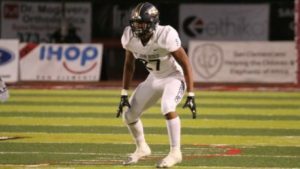 I’m not a huge fan of Amon-Ra St. Brown’s attitude and antics, which were on display during the U.S. Army All-American Bowl, but the kid can play. Michigan had a shot at him when he visited, but there were multiple schools out in front of the Wolverines all along. 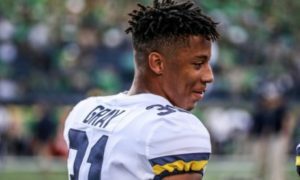 Michigan took four receivers last season, including two who look like very promising for the future, so wideout wasn’t a huge need in 2018. Scoop: Michigan seemed to have a good shot at numerous tight ends in 2018 – Luke Ford, Brevin Jordan, Will Mallory, Malcolm Epps, Tommy Tremble – but Ruckert was the cream of the crop. Even though it was obvious he was picking Ohio State, it still stung considering how OSU is very inconsistent about using tight ends. Meanwhile, Michigan was coming off of a year in which their tight end won the Mackey Award in 2016 and should have won it in 2015. Schoonmaker is converting from quarterback, and I’m not in love with Muhammad as a pass receiver. They’re decent prospects, but Michigan whiffed on the Ford recruitment and oddly lost the battle for a legacy recruit in Will Mallory. Meanwhile, the one decommit (Taylor) never really panned out after committing to Michigan very early in the process, and he ended up signing with Cincinnati. Scoop: I’m giving Michigan the benefit of the doubt here and assuming that Hayes will not be a tight end for the entirety of his career. Just like Ben Mason was identified as a linebacker early and then became a fullback, I expect Hayes to spend maybe a year at tight end before moving to tackle. 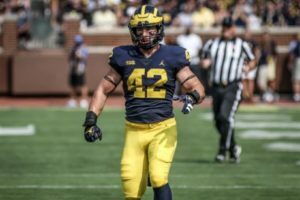 Offensively, the biggest problem for Michigan this past season was ineffectiveness on the offensive line, particularly at right tackle – and now the left tackle has graduated. Even if Calvin Anderson transfers from Rice, that’s a Band-Aid that will be ripped off in 2019. If Hayes is a tight end long-term, then this grade probably drops to a D-. And maybe I’m still being generous. Michigan needs more linemen in general, and more tackles in particular. I like Hayes and Mayfield because they’re athletic, but Michigan is walking a razor-thin line. Maybe it is my conservative nature or distrust of the NCAA, but the A- for QB has to be flashing gray or something. I will relax a bit when I hear Patterson is cleared to play this year. Thanks, but I think the OL grade is still too high. I’m not a screaming Nancy like we see on other sites, but only one signed OL, but three RB? Missed on Patterson to ND? I think Thunder’s scoop comments are on the money. I like the athletes like Hayes and Mayfield also but am concerned how they will fit now that Frey is gone. C+ is generous but optimistic, I can use some of that. I like Van Sumeren at FB, and I like Barrett especially but who knows? Viper? Wildcat? RB? 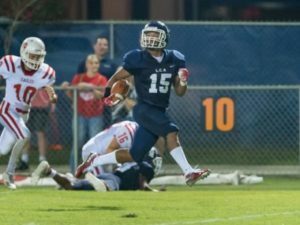 What I would like to see with at least one RB or WR every year is “really fast”. Haskins and Turner make more sense than Kurt Taylor. I completely agree with je93. I don’t understand the signing of 3 RB and multiple DB when OL is clearly the issue on the offense. I know that they missed on their top targets but surely they need to have a back-up plan. 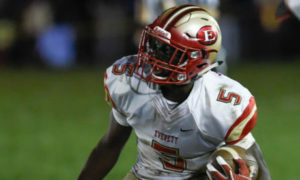 I also do not think that Calvin Anderson is coming given that his offer list keeps growing (Texas A&M has also offered). the development of…….the OL that I don’t even know where to begin. This coupled with QB’s with respect to the above 3 categories really has me calling into question the general perception as to Harbaugh’s ability to recruit, coach & develope……… i.e – he came to Michigan perceived to be ‘great coach’; ‘great recruiter’; great QB guru’. Certainly he is ‘good’ at his profession but and its a big But! ‘Great’ ? Not so sure anymore. School is still out and I’m not going lie here at all but I’ve detached myself from the entire Michigan Football thing for now until MBB and Hockey seasons play out. I want to root & cheer for those squads during their seasons but I hope after tourney play or maybe even after the Spring Game might be better we can all jaw in depth about these issues all summer long…………. 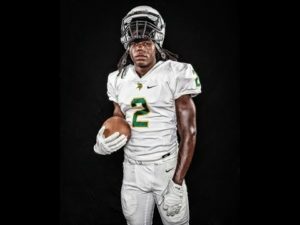 I’m not optimistic about Joe Milton. It’s not just the obvious problems that often get pointed out. But it’s that, at the end of last season, Rivals said, “a monster arm but he continues to make poor decisions with the football”. This speaks of bad habits. And bad habits are very hard to get out of a person. It will not get any easier at the NCAA level for him. I can’t see how he is going to pass Dylan McCaffrey. Most Excited About: Michael Barrett- I like difference makers and I think he’s one of the few difference makers. Most people don’t like taking 3 RB’s in this class, but I’m ok with it. I’d rather take a chance on an extra one than a throw-away offer for depth. Most Underrated: Wanted to go with BVS, but I’m sticking with Jalen Mayfield. Not sure he’s going to be OT, but I’d bet he’s going to be a solid contributor for 2-3 years as a starter somewhere on the line. Least Excited about: Luke Schoonmaker – Wild card in this class but there isn’t enough in film to make me think he’s going to be able to block anyone. I’m a little biased because I really didn’t like that they offered him this early. Thought you could have waited until early signing period and pulled him if needed. Most Overrated: Joe Milton – Not even sure if he’s rated that high anymore but other than an arm from the gods there isn’t much there. He’s SLOW for what people are calling athletic. His decision making seems poor from what I can find. I’m the first person to say that completion percentage is WAY overrated, especially in HS with poor receivers and bad routes. Give me a QB with 5% less completion rate and intelligence and they can lead a team to greatness. QB’s have to throw the ball away or unintentionally ground a pass (completion rate goes down) sometimes rather than take a 9 yard sack or a completed pass for -3 yds (completion rate stays same or goes up). Milton made bad decision and was inaccurate. Overall, not horrible recruiting but probably in the “C” category for me overall. BTW – I don’t count Shea Patterson for this. Personally, I don’t believe a recruiting class should include transfers. 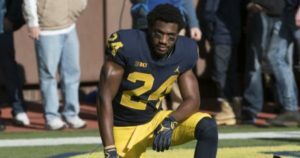 It’s also my belief that if Shea is not eligible this year he may NEVER play for UM instead just opting for draft next year. Michigan fans should ask themselves if including Patterson in this sort of thing makes any sense at all. Patterson will not be eligible in 2018, per NCAA rule. That this may be news to some people or seen as contrarian is probably worth further examination. Yes, some pundits are reporting the staff is ‘confident’ that a requested rule waiver will be applied. That’s great unless you remember the various other recruits and instances of player development this staff has been confident about. Confidence isn’t an issue with this staff. Nor is it particularly relevant. Last I heard the waiver hasn’t even been submitted. The basis of the argument for the rules not applying to Patterson are unclear. What is clear is that the NCAA won’t take into account wishful thinking of fans anymore than they took it into account for Ty Isaac. At least that one had plausible merit, if you bought it. I never heard anything about his family health again, not that I ever should. Point is, this is a rerun. Fans are setting themselves up for disappointment. When Isaac was transferring people also assumed he’d be an impact player and eligible right away. Even though the rule was totally clear that he wouldn’t be. There isn’t much (any?) precedent for the sort of waiver Patterson might pursue being successful. There’s no good reason to think it will be, unless you listen to the pundits – who, it should be remembered, peddle hope to fans thirsting for it. So, start with the assumption that the rule will be applied as it says it will be applied. Rules typically are. That leaves Michigan with 1 quarterback who has played college football. One. Presumably they know something about the redshirt freshman backup. 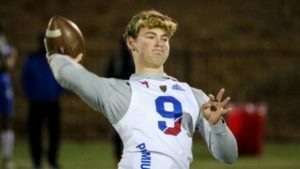 The third QB is a recruit universally considered to be very raw for an incoming freshman. Not finding a reasonably polished high school QB who could plausibly step in as a backup (or least a competitor to McCaffrey for the backup job) seems like a massive failure by this staff. There is some precedent in that some Penn State players, for example, were allowed to transfer and play immediately. Obviously, the PSU and Ole Miss situations are different, but it’s not unprecedented that schools in trouble can lose players without the players having to sit out a year. The OL has been an unmitigated disaster over the duration of the Harbaugh regime. What could be easily excused in 2015, is now transparently on them. By them I mean Tim Drevno. There is no rational reason to expect it to be better in 2018, though of course it could be. We can plausibly believe Drevno will be replaced if things aren’t turned around this season, so what’s perhaps more troubling at this moment is the QB situation, which seems to be getting worse every year. I’m not going to knock Harbaugh’s track record with QBs but at some point it doesn’t matter. 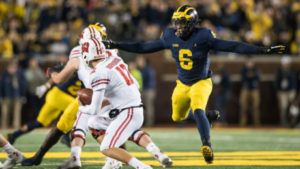 Even if Patterson pans out in 2019 that would mean the two best seasons from QBs in 5 years of harbaugh at michigan would be transferring starters from other schools. 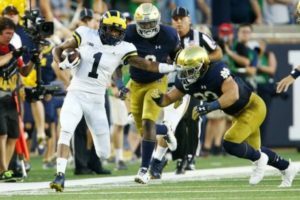 This is nothing profound but Harbaugh really really needs McCaffrey or Peters to perform at an all conference level in 2018 or his reputation as a QB guru is out the window. It’s not going to be very easy or likely unless they fix the OL. Moreover, Patterson lurking in the background for 2019 will have serious consequences for the prospects of the loser of the Peters/McCaffrey battle. With 3 highly ranked QBs in 2 classes there’s little to no chance all 3 will remain in 2019. So depth will continue to be an issue as Milton projects as the 3rd string QB again in 2019, if not the backup. Not only is QB recruiting a problem from a talent perspective (Michigan has yet to land the guy it wanted most in any class, though Peters wasn’t far off) it’s a problem strategically. 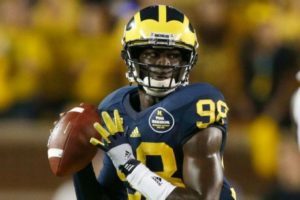 Michigan is not recruiting enough to offset transfer departures or developing quality backups it can count on. This was a bad year with a bad finish following by a disappointing recruiting class. A recipe for a torrent of intolerable bitching from fans. I’m contributing to it right now, I realize. 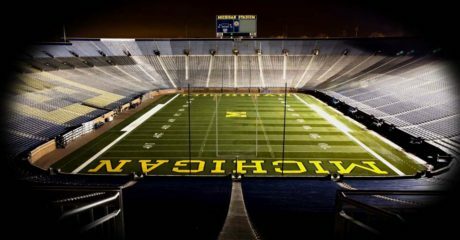 That is not my intent – there are plenty of reasons to be optimistic about Michigan football in 2018 and beyond. Unfortunately the overriding questions about this regime related to scheme and OL development are not included in that list and the expectations for QB development have plunged since September. Or should have. 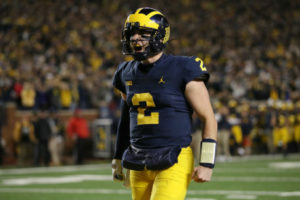 Most fans did not care and continue to not care, but I continue to see the Wilton Speight transfer as a potential disaster for Harbaugh and therefore this program as well. Agree on the QB situation. I’ve always felt that one of McCaffery/Peters would end up transferring. Peters if he loses out and is the backup and McCaffery if he loses out because he’s only one year behind Peters. Speight leaving and Patterson transferring in probably speeds the transfer process up. Instead of possibly having the starting QB graduating next year, if you presume Patterson is the starter then the starter is now here for two more years. Even if Peters beats out McCaffery but loses to Patterson, Peters might transfer. Barring an injury to Patterson, Peters would only have one year left when Patterson is done. 2019 actually becomes a pretty big year for signing another high level QB prospect. 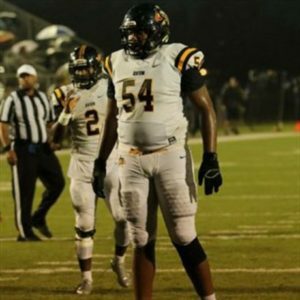 Is there a reason you don’t list Emil Ekiyor isn’t listed as a decommit? If you have addressed this elsewhere, I apologize. It was just a simple oversight on my part. I fixed it. Thanks.